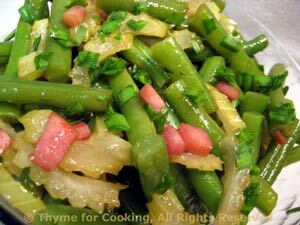 Green Beans with Celery, Thyme for Cooking sides for summer. Green beans, cooked quickly, then tossed with sautéed celery and a bit of ham or bacon for flavor, something a little different from our summer bounty. Blanching them first helps retain their bright color. Heat a medium saucepan half full of water to boiling. Add the beans and cook for 4 minutes. Remove and plunge into cold water to cool and preserve color. Drain. Add bacon or Prosciutto and sauté briefly. Add celery and sauté about 5 minutes. Add remaining ingredients to pan and heat through, stirring to dissolve mustard and sugar. Add beans, heat through and serve.